Located at the leg of the gigantic Himalaya, Manang is an exceptional village with a dense collection of 500 flat-roofed houses alienated by narrow alley ways. Manang is a major stop-over on the Annapurna circuit trek. Many travelers trekking the circuit from east to west use at least a full day resting in Manang in order to get used to to the higher altitude. Manang town itself flourished due to its role as a Tibetan trading settlement and tourist destination. To arrive at a doorway you must raise a steep log notched with steps. The structure of the village is most vivid, with the pinnacles of the Annapurna and Gangapurna less than 8 km away, and an enormous ice fall echoing and crashing on the borders of the peaks. Gompa at Manang and Braga are a worth visiting sites. There are several side treks that start from Manang including the admired trek to Tilicho Base Camp at Tilicho Lake. Other sites comprises many stupas and monestaries located in the Manang Valley as well as sights of Pisang and Chulu mountains. 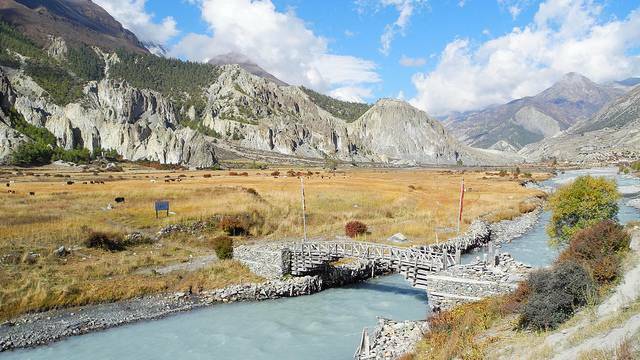 A 6 day trekking from Besi Sahar of Lamjung District will seize you to the Manang village. There are regular bus services to Besi Sahar from Kathmandu. Manang also has an airstrip.